Fireplane Interconnect (Backplane) , 9.6GigaBytes/ second between CPU Boards via two 32 Byte wide 4.6GB data buses. 2x 1Gbit Fibre Channel drive controllers to disk backplane for disk multipathing. I realized that I never actually created a page for the server itself showcasing the powerhouse of a previous internet generation. . So here goes 😉 In late 2011 I had issues with my current web server at the time, a Dell Precision workstation. I had a brownout at my house and it ended up blowing all the capacitors in the entire thing. (Blogpost on this here) As luck would have it, this server replaced the previous server from capacitor issues just a year prior.. (blogpost on that here LOL ) So needless to say when I was crippled a year later by a similar failure on a different computer I decided to stop messing around and find some good hardware. I scoured eBay for various servers, thoroughly researching the RAM, Cache, Speed, and power demands of each one. I needed something that was capable of taking a failure of any kind, maybe even multiple failures and still have access to my data. I really wanted the HP 9000 Server I was looking at, rp7420 with 8x dual core pa8900 PA-RISC CPUs, each CPU has 64Mb of Cache. It didn’t really seem to offer the storage I was after however, and required 220v power. This was most of the deciding factor in my choice, was knowing that one day I would probably need to plug it in at home somewhere and 220v isn’t exactly easily accessible at most homes. (That will change as electric cars become mainstream however 🙂 ) After turning away from the HPs I started to look an old friend, Sun. . The very first versions of my websites were hosted at one point on my SparcServer 1000, which had 8x SuperSparc 90MHz CPUs . It was a really neat machine. It had probably 4Gigs of ram and it was all in 30 pin SIMMs which is really silly. 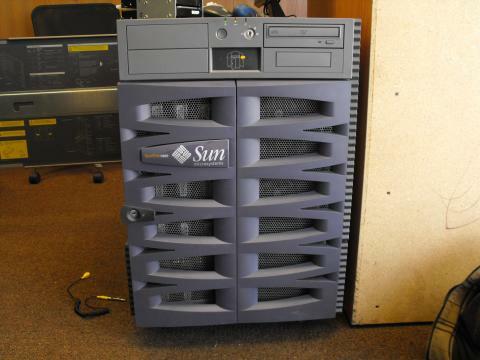 I knew that the market at the time was flooded ith Sun stuff, and not being X86 nobody really cares about the Sparc machines. They are a dime a dozen at the recycler now, because nobody knows how to use them. Solaris 10 is still supported by Oracle, albeit not for long. . Firefox and Thunderbird have current releases for Solaris 10 Sparc, and there are a whole host of packages that one can obtain. Because it’s Solaris 10, and almost nobody uses it anymore, it’s a little bit of security by obscurity. A conscious approach to setting up security on a Solaris 10 box, and only the wiser would know where to start. If course there are holes in server software still, such as Apache, SQL, and SSL.. At least it will be very hard to root the box. With this in mind, I landed on two choices, v880 or v890.. The 890 requires 220v power only to the 880 was the way to go. In very late December of 2011 / Early January of 2012 I picked it up. The image below will take you to that original blog post: I picked one up and set about setting it up the way I wanted. There were so many options offered for these systems in the day you can almost configure it an infinite number of ways. It has served me well over this year so far, playing the roles of all services I need, file storage, web hosting. Even providing a desktop that I can work from anywhere in the world. Using SunRays, a sort of graphical “Dumb Terminal” or X terminal I was able to transform my business from using 5 or 6 computers down to one, and a secondary one to handle HD Video Editing tasks. 4 other peeps rated this an average of 5.